Life cannot exist when the body and the spirit are separated. Both are needed for life to happen. Faith without works isn’t alive. The spirit may be willing, but if your flesh isn’t following suit, you don’t get it done. Our faith is to represent the living God we serve. Everywhere, serving everyone, every moment. If we are followers of Jesus, we are to do as He did. We are to go everywhere we are lead and serve everyone He asks us to — every opportunity we can. 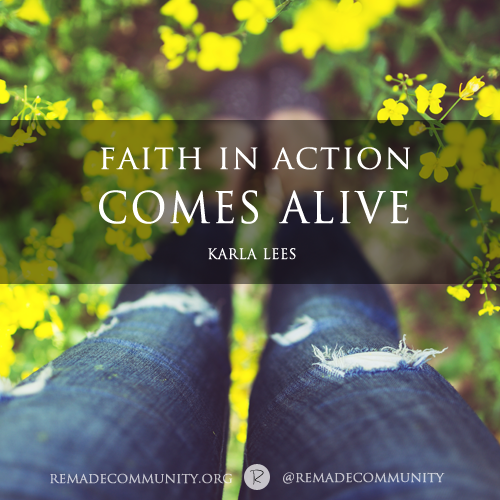 Faith in action comes alive. Today, ask Him to awaken your desire to have a living faith which permeates every area of your life. Let faith arise, and may those around you be blessed as you follow where He leads you to be His hands and feet to all He loves. This post first appeared as a Drop of Encouragement at Remade Community today.